People are constantly looking for ways to get the best gas mileage possible for their vehicle. Jiffy Lube® is here to help you learn how to get more miles per gallon on the road so you can stretch gallons and dollars further. The best way to improve fuel efficiency is to pay attention to driving habits. Aggressive driving is not only unsafe, but it also puts strain on the engine, which causes it to burn fuel faster. You can pay up to an extra $0.24 per gallon for every five miles per hour you drive over 50 mph. One way to avoid letting speed creep up and get better gas mileage on the highway is by using cruise control. Don’t race from stoplight to stoplight. Smooth acceleration and deceleration and avoiding unnecessary stops tend to conserve fuel. Overdrive gears help improve fuel efficiency by reducing the engine speed for a given road speed. They can also reduce engine wear. A vehicle that sits still with its engine idling gets 0 miles per gallon. Even if you’re just running inside for a minute, remember to turn off your engine. Remove clutter that has accumulated in your backseat, trunk or cargo area. Driving around with an extra 100 pounds can reduce mpg by up to 2%. 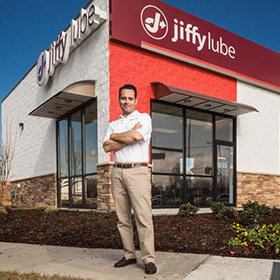 Regular visits to your local Jiffy Lube® can also help with fuel efficiency. Our technicians can ensure your tires are properly inflated on each visit. Underinflated tires may lower gas mileage by .3% for every 1 psi drop in pressure in each of the four tires. You don’t have to reach for your calculator; what that means is that if all four tires were low, once properly inflated, you’ll see a significant improvement in fuel economy your very next tankful. Plus, properly inflated tires are safer and last longer. Ensuring your engine is properly tuned. Fixing out-of-tune engines or bringing vehicles that have failed emissions tests back into compliance can improve gas mileage by an average of 4% (results vary based on vehicle and types of repairs). Regular preventive maintenance at Jiffy Lube can help avoid these conditions in the first place. Using the recommended grade of motor oil. For example, using 10W-30 motor oil in an engine designed to use 5W-30 can lower gas mileage by 1-2%. Another reason you can Leave Worry Behind® at Jiffy Lube: we use your vehicle manufacturer’s recommendations. Upgrading to synthetic motor oil. Typically engines are more efficient using synthetic or synthetic blend motor oils rather than conventional motor oil. For more tips, or to follow the ones listed above, Find Your Jiffy Lube on our locations page. Source: United States Department of Energy. For more information visit Fueleconomy.gov.